I got a new Ridgid R4512 just before Christmas to replace my old Craftsman saw that was taking up too much space. I sold my old saw to an anxious young guy just starting out for a very woodworker friendly price. Anyway, my old saw had a router wing and I wanted one for my new saw. I checked Lumberjocks and a few other sources from the web and this is what I built. A Kreg insert plate with a Bosch 1617 router. 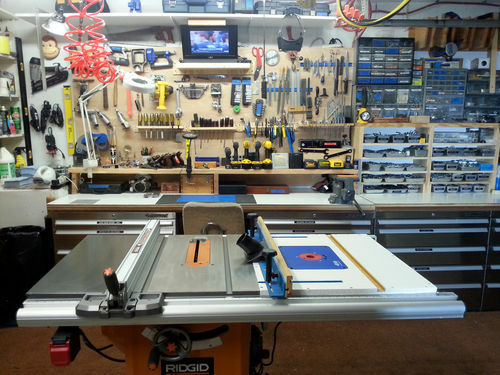 A lot of woodworking in a smaller footprint then my old set up. The build was done a little at a time as the holidays and work duties came first. The result has been great and I think I will get a lot of use from this. Took my time and got a perfect fit. If you have any questions, I’ll do my best to answer them. If you take knowledge from LJ’s, give back when you can. Nice setup! Love your organization skills! 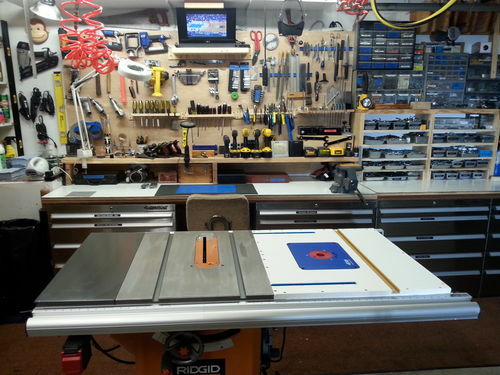 Very nice.What thickness did you make the router wing?.That looks like a Rockler Fence?. jeff, the top is a combination of melamine plywood with an underlaymeny torsion box frame arrangement. I made it that strong because the router weighs a lot and I figured better too strong then not strong enough. And the fence is from an old router table from a million years ago, but easy to use. And “easy to use” is very important to me. The only thing that I’d add would be legs under the router extension table. Better safe than sorry. Hey Eric, I am finally retired. Somehow I am filling up the days pretty well. I have this TS in La Conner. 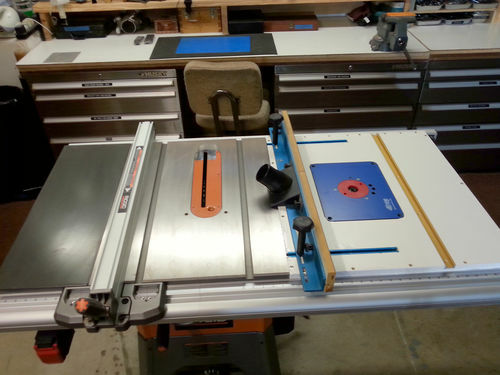 I haven’t gotten around to making a router table setup there, but that sure looks like a good option. In La Conner, everything has to go back to its place against the wall so that I can get all the cars in. I have to remove just one of the cars, and then I have a good size shop. Here in Anchorage, a TS wing wouldn’t work for me because I didn’t have good access to the wing. So I built a mobile router center. I have two Bosch 1617 routers, one dedicated to the table. Hopefully I will post that project soon. The only complaint I have about R4512 is the thin insert. Hard to make a ZCI to fit that. I think Grizzly has a phenolic insert that fits it, though, so I will have to visit their showroom in Bellingham when we go there in about 10 days. Thanks for the post, I will have to evaluate my situation, and see if this will work in La Conner. 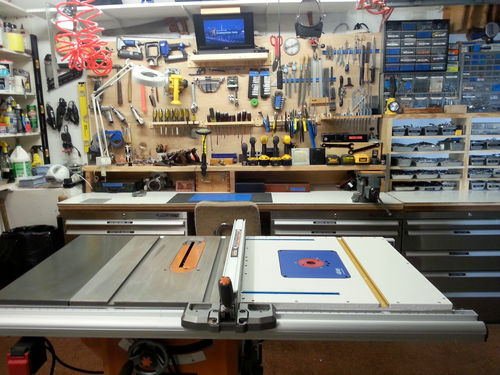 How did you attach the router table to the saw rails/table. Rigid Saw with a homemade base. Great job, Eric. This is the perfect setup to save space. Besides that, you chose the perfect spot to shoot your new rig and show LJs your new wall tool storage setup. Nice and clean, that’s the way to go ! How can you have a handle like Wrecker when you have such a neat shop mate?. Thank you all for te kind words. Charles, the saw has natural attachment points that I utilized along the rails. It’s almost like they expect you add a table.